WASHINGTON, D.C. (Dec. 15, 2014) — The U.S. Senate on Monday Confirmed Dr. Vivek Hallegere Murthy as the next Surgeon General of the United States. The Senate vote of 51 to 43, follows President Barack Obama’s nomination of Murthy in November 2013. Obama said he applaud the Senate for confirming Murth. Vivek will also build on the progress we’ve made combatting Ebola, both in our country and at its source, Obama added. Since 2009, Dr. Murthy served as the President and Co-Founder of Doctors for America. He is also a Hospitalist Attending Physician and an Instructor in Medicine at Brigham and Women’s Hospital at Harvard Medical School. He received a B.A. from Harvard, an M.B.A. from Yale School of Management, and an M.D. from Yale School of Medicine. Mee Moua, president and executive director of Asian Americans Advancing Justice | AAJC, said she is thrilled that the Senate finally fulfilled its duty and appointed Murthy. Kathy Ko Chin, APIAHF president and CEO of Asian & Pacific Islander American Health Forum (APIAHF) said Murthy brings the deep experience and commitment to improving our nation’s health that we need as a Surgeon General. APIAHF strongly supported Dr. Murthy’s nomination and looks forward to working with him as Surgeon General. APIAHF thanks the many Senate champions who spearheaded his confirmation, including Sen. Mazie Hirono. Sen. Hirono has been a champion for health access for the underserved and a key ally in making sure our nation’s highest offices reflect the diversity of our nation, ensuring that the needs of AAs and NHPIs are at the forefront. Center for American Progress President Neera Tanden, said that at a time when we face numerous public health challenges both at home and abroad, America needs a surgeon general who can guide the nation’s health responses and instill public confidence. Rajan Zed, Chairperson of Indo-American Leadership Confederation in Nevada, said he feels honored by the confirmation and called it a smart choice. “We believe that he will continue with his dedication to improve the health and well being of all Americans, making a positive impact,” Zed said. 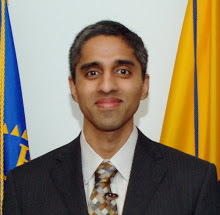 In October 2014, several CAPAC Members led a letter to Senate Majority Leader Harry Reid and Senate Minority Leader Mitch McConnell, urging them to expedite the confirmation of Dr. Vivek Murthy. U.S. Rep. Judy Chu (CA-27), CAPAC Chair, said the confirmation comes at a critical time for our nation as we work to address various public health concerns, including the Ebola epidemic abroad. U.S. Sen. Mazie Hirono (HI), said Murthy is highly qualified and she was particularly impressed by his work at a company he founded where he identified inefficiencies in clinical drug trials and then developed solutions to help treatments get to market more quickly. U.S. Rep. Mike Honda (CA-17), CAPAC Chair Emeritus, said the confirmation is great news for the nation and for the Asian American and Pacific Islander community. It gives voice to overcoming AAPI health disparities and barriers to health care, including a lack of available culturally competent and linguistically accessible health care. Murthy’s wealth of knowledge on public health issues will ensure his success in his new role of safeguarding the health of our nation, he said. “His qualifications were never in question — the only delay was because one faction of the Republican Party chose to play politics with America’s health,” Honda said. “Dr. Murthy’s confirmation strengthens the AAPI community’s voice and presence, and marks a positive step toward addressing the need for greater diversity in all levels of government. U.S. Rep. Ami Bera (CA-07), CAPAC Health Care Task Force Co-Chair, said that as a practicing physician and instructor at Brigham and Women’s Hospital, Murthy was a champion of innovation in medicine, and a leader in the medical community. U.S. Rep. Barbara Lee (CA-13), CAPAC Health Care Task Force Co-Chair, said that an eminently qualified physician has won the support of our nation’s preeminent health and physicians groups and shown strong public health leadership at home and abroad. “He will make history as our nation’s youngest and first Asian American Surgeon General,” Lee said. U.S. Rep. Joseph Crowley (NY-14), Congressional Caucus on India and Indian-Americans Co-Chair, said Murthy is a dedicated fighter for public health, and will work tirelessly to improve the health of all Americans. U.S. Rep. Doris O. Matsui (CA-06), said Murthy has worked to improve public health through education, research, and by providing care for two decaded. “I am confident that his education and experience will enable him to provide strong leadership as the nation’s doctor,” Matsui said. U.S. Rep. Grace Meng (NY-06), said the vote was long overdue and never should have taken this long but is happy that it finally occurred.